The cubicles of your office are one of the most important features, both in terms of aesthetics and function. For cubicles that are attractive, durable, and available in many styles, turn to NorthPoint Office Furniture. 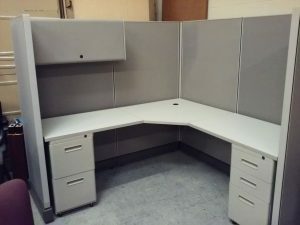 We sell new, used, and refurbished cubicles, making it easy to find options that are within your budget. What’s more, we have been assisting business leaders in the Alpharetta area since 1994, so we have decades of experience in helping customers find the right office furniture solutions for them. For more information on the cubicles we have available for your office in the Alpharetta area, contact NorthPoint Office Furniture today. You are also welcome to visit our 8,000 square foot showroom to see our office furniture offerings in person, test them out, and speak with a helpful representative.